With a stunning contrasting wooden top, our Gloucester sideboard embraces a fabulous contrast between wooden and painted finishes to create a subtle elegance. Perfect for storage with four large cupboards, the sideboard is crafted to complement all of our Gloucester collection making the piece truly magnificent as part of a collection. 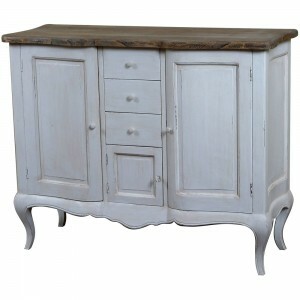 The Gloucester range exudes classic sophistication whilst boasting a modern twist on traditional French country styles. 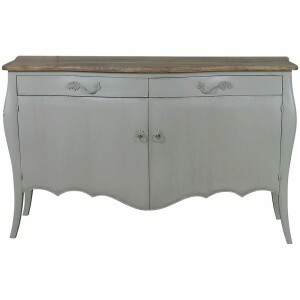 Crafted with curved legs and beautifully finished with a distressed grey colour.